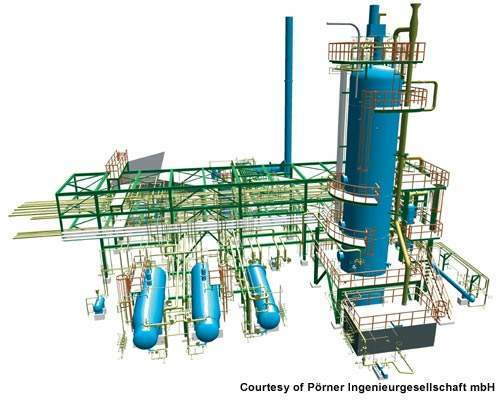 In October 2009, SAMIR awarded a lump-sum turnkey contract to Pörner Ingenieurgesellschaft for the planning and construction of the Biturox bitumen plant. The primary component of Biturox technology plant will be a loop aeration reactor, enabling the continuous oxidation process. Bitumen production is an important downstream business for refineries. Work on the Bitumen project started in January 2010 and was completed in July 2011. The Moroccan refinery company Société Anonyme Marocaine de l’Industrie du Raffinage (SAMIR) built a new bitumen plant in the port city of Mohammedia, Morocco. Bitumen is a highly viscous and elastic organic liquid composed of a complex mixture of chemical compounds. The plant produces 40 / 50 grade road-paving bitumen and has a capacity of 270,000tpa. The project includes the construction of two bitumen storage tanks with 5,500m³ capacities and a HGV filling station. Work on the project began in January 2010 and was completed in July 2011. The project was estimated to have cost €21m. The SAMIR bitumen plant is based on Biturox, a process technology developed by the Austrian engineering company Pörner Ingenieurgesellschaft. Biturox makes use of the oxidation process in producing bitumen polymers. Pörner has built more than 35 Biturox licence plants across the world. Biturox technology can produce bitumen from less expensive crudes. Residues from the distillation process can be blended with other refinery bottoms for optimising feed compositions. The feedstock compositions can be further processed through the controlled reactor system. The Biturox process efficiently uses utilities such as steam, air and water. The conventional distillation process of bitumen production requires proper crude blends and therefore offers less flexibility. The downstream processing of Biturox utilises the feedstock composition of different crude blends for producing bitumen. The main components in the feedstock include a harmonised balance of aromatics, naphthenes, asphaltenes, saturates and resins. The properties of the final product are controlled by varying crude compositions. The lifetime of a road made of multigrade bitumen is enhanced by increasing the polarity of the aromatic components in the feed crude. "The SAMIR bitumen plant is based on Biturox, a process technology developed by the Austrian engineering company Pörner Ingenieurgesellschaft." The Biturox process is used to produce different quality bitumen grades such as industrial heavy-duty binders and multigrade bitumen for road surfacing. The primary component of the Biturox technology plant is a loop aeration reactor, which enables the thermo-chemical conversion of the feedstock and air-oxygen. The oxidation is a continuous process under repeatable specifications. Parameters such as residence time, temperature, pressure and flow rates of the chemical process can be controlled. The medium molecular-weight aromatic compounds formed during the Biturox process are preserved in the reaction mixture. The bitumen produced improves elastic and adhesive properties. The reactor has a cylindrical cone coated with three stages of the Biturox agitator, which results in a homogeneous reaction of the circulating product with the fresh feed. The process reduces the overheating of the chemicals and eliminates dead zones of the reactor for maintaining a uniform product quality. The temperature of the reactor is maintained by injecting water along with the processing air into the system. Controlling the flow rate and increasing the polarity of aromatic components prevents bottom coking and excessive reactions from occurring. The Biturox reactor utilises optimum oxygen, which reduces the processing time and operating costs. Maximum utilisation of oxygen in the reactor decreases the risk of ignition and ensures the safety of the plant. The gentle introduction of air during the process limits the bitumen from thermo-cracking. Homogeneity and steam exposure are maintained throughout the process for stripping effect. Controlling the temperature inside the reactor and continuity produces a homogeneous bitumen product. Biturox plants require little maintenance and can be operated for several years without cleaning. The continuous operation can also be altered by varying flow-rates to change the bitumen grades without any interruptions. In addition, the plants can be automated. 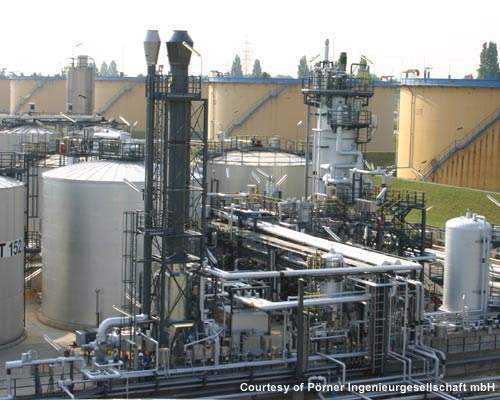 In October 2009, SAMIR awarded a lump-sum turnkey contract to Pörner Ingenieurgesellschaft for the planning and construction of the bitumen plant. 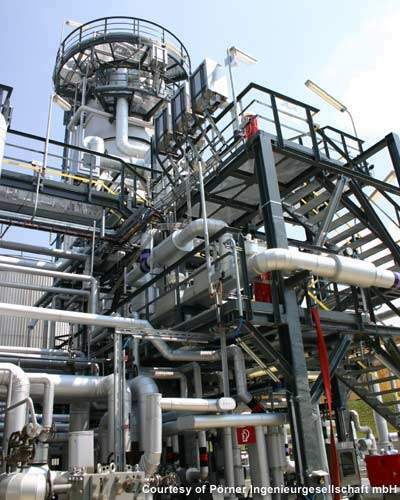 Pörner installed its Biturox technology for the production of bitumen polymers. "Pörner licensed Biturox technology plants account for about 8% of total bitumen demands across the world." Pörner+Partner Ziviltechnikergesellschaft, part of the Pörner Group, was responsible for the civil engineering. An export contribution for the project was funded by the Austrian Control Bank (OeKB). Bitumen is mainly used for the construction of roads. The high-quality bitumen binders are used as a component of road paving material to make it durable and cost efficient. The product is, thus, an important downstream business for the refineries. It is also used for construction coatings, bitumen emulsions and roofing felts in the speciality chemicals industry. The SAMIR plant meets the total demand for road paving bitumen in Morocco. Pörner licensed Biturox technology plants account for about 8% of total bitumen demands across the world.